It's the first 'Who Shot Ya?' of the year! And even though this episode was recorded in 2018, it's still fresh as can be. The gang is graced by the presence of the wonderful Cristela Alonzo to talk about Alfonso Cuarón's Roma. So we have an Alonzo, with Alonso, talking about Alfonso. Cristela discusses her childhood and how she deeply related to the film. Drea may or may not have found a giant bag of money in the new year. The crew casts their own biopics. And as always, staff picks. With Cristela Alonzo, Drea Clark, Alonso Duralde, and Ricky Carmona. It's well known in the Rocketeer community that our host this week, Wynter Mitchell-Ragnarok, is a huge horror buff. She watches two to three a week, and she is running out of horror flicks to watch on all the streaming services. Send her your recommendations! In the meantime, Wynter forced Karen, Margaret and Who Shot Ya?’s Ricky Carmona to subject themselves to some of her favorite movies from the holiday genre, such as Black Christmas, Silent Night, Deadly Night, and their sequels. Our special guest this week is the hilarious Ricky Carmona, the host of the Maximum Fun movie podcast Who Shot Ya? and he's also a staff writer on the Comedy Central TV series Tosh.0. 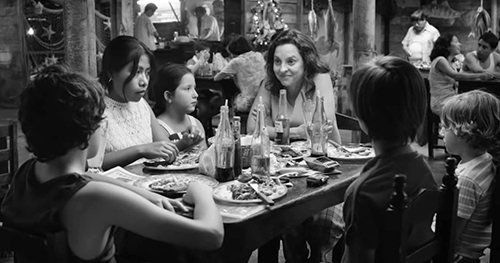 Margaret is all about ROMA, a new film by acclaimed director Alfonso Cuarón. The movie is heavily based on his childhood in Mexico City in the 1970s and his family's live-in housekeeper. Karen has a backhanded All About on Netflix's bro-y, new food competition show The Final Table. Ricky is all about Adam Sandler's latest stand-up comedy special also on Netflix called 100% Fresh. Wynter is all about season 1 of the USA Network crime drama The Sinner starring Jessica Biel and Bill Pullman. Margaret - Phosphorescent - New Birth in New England. With Wynter Mitchell-Rohrbaugh, Karen Tongson, Margaret Wappler , and Ricky Carmona/a>.